Whether you are after amazing videos or expecting a friendly community, Vimeo couldn't be better. More importantly, the video portal makes it easy to upload videos you take. But for DVD addicts attempting to upload the physical disc to Vimeo for sharing with family and friends, they will pull a long face snoot since this video-sharing site doesn't recognize DVD format. Below is the scenario you'll encounter. I created a DVD of live dramatic performance three days ago. Now I'm wondering to upload DVD to vimeo site for sharing with my buddy. Any solution? BTW, I'm using a Mac Mountain Lion. Officially, Vimeo only supports such video formats like MP4, WMV, AVI, FLV, MOV, etc. Any video that isn't encoded in H.264,Apple Prores 422 HQ, or HEVC will encounter video upload issue. Now that DVD is encoded in MPEG2 which is not in the list, the only thing that needs to do is to rip DVD to a format that is friendly with this site with the help of a DVD ripper for Mac. To accomplish this task, a trustworthy MacX DVD Ripper Pro allows you to rip DVD to MP4, DVD to FLV, MOV, AVI, etc on Mac for uploading onto Vimeo site with fast speed while delivering exquisite picture. This program circumvents all new DVD movies with copy protections like CSS, region code, Sony ARccOS protection, etc, making DVD Conversion without any obstacles. More notably, for those who are not professional with video format, this DVD ripper for Mac also furnishes output profiles for Vimeo, thus enabling you to directly convert DVD to Vimeo with right settings for further uploading without error. MacXDVD Software offers two versions to finish the task of DVD conversion. For Mac users, you can download Mac Version DVD ripper. For windows users, you can just download DVD Converter for Windows on your PC. Free download and run this Converter on Mac OS X, import DVD by means of clicking "DVD Disc" button. Alternatively, you can import this disc by hitting "DVD Folder". Tips: Vimeo only allows basic users to upload video within 500MB per week and 5GB a week for VIP users. 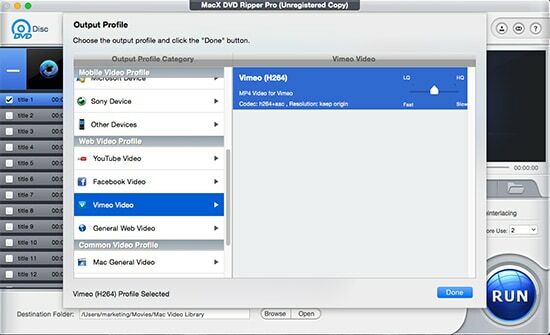 To ensure a smooth movie uploading to Vimeo, you can enable the video editor built in MacX DVD Ripper Pro to cut and trim the video segment and merge video files based on your own need. According to Vimeo official site, it is advised to rip DVD to H.264 with a proper pixel aspect ratio of 1:1, or square pixels. 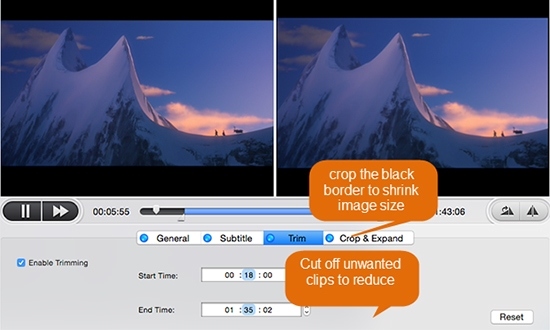 You can also take advantages of MacX DVD Ripper Pro to crop the video and change to the correct aspect ratio. After finishing the above steps, start ripping DVD to Vimeo friendly format on Mac for uploading by clicking "RUN" button. In addition, MacX DVD Ripper Pro also makes it perfect by furnishing great ability to upload DVD to YouTube and offering other output profiles for mobile devices like iPhone, iPad, iPod, Android phones, Android tablets, Xbox, PSP, etc. Besides, for those who'd like to download YouTube videos Mac for watching on the move without network bothering, the sister software from MacXDVD could do you a favor. - MacX Video Converter Pro, helps to free download online videos from Vimeo, YouTube, Facebook, Dailymotion, Myspace and 300+ video sharing sites without any quality loss at blazing fast speed. - MediaTrans, allows you to transfer your downloaded online videos or any other local videos from Mac to iPhone iPad iPod for offline watching despite of format incompatible issues. It will convert videos to iPhone video format automatically during the video trasferring process. The best DVD ripper software is shared here for you to convert DVD (protected and non-protected) to Facebook supported format like MP4 with fast speed and high quality. This article shares 7 easy ways to free download Vimeo videos on Mac (El Capitan) at one go and convert the downloaded Vimeo videos to QuickTime, iTunes, iPhone, iPad supported formats like MP4, MOV, M4V for offline playback.